Carnival Magazine, in publication since 1966, is a monthly publication dedicated exclusively to bringing news, information and history of the amusement industry right to your doorsteps. Whether you are involved in the business, a carnival buff or enjoy some other aspect of the industry, this is the publication for you. Midway Talk – Up to date information about what’s going on from various midways and manufacturers. Midway Personalities – Presenting people who make the business what it is today. Direct from the Lots – Photos of individuals involved in the industry. New Products – Spotlighting new industry products. Do You Remember – Rides of the past offering a walk down memory lane. Plus many additional monthly features. February – Previews the February IISF Trade Show. April – News from the IISF Trade Show plus photos of new equipment. May - Provides a directory of carnivals in North America and contact information. June – Provides fair route listings for carnivals. 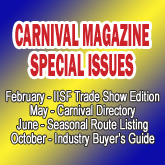 October – Buyers guide of various vendors for the carnival industry.